The Police Executive Research Forum (PERF) is a group of left-leaning supposed “police executives.” Despite the name, they are not a police organization which represents police. Rather, they are in the habit of blaming police for any action the cops take – instead recommending policies of police inaction. Because they and their policy recommendations are invariable leftist, liberal news outlets like the New York Times (NYT) have a habit of quoting them and their suggestions for better policing. In June of 2015, the Times posted an article entitled, “The Growing Right-Wing Terror Threat,” where the NYT quoted a survey they conducted with PERF. PERF concluded that the number one terrorist threat is not eco-terrorism or Black Lives Matter (BLM) radicals, or even Islamists. No – according to PERF, “74 percent reported anti-government extremism as one of the top three terrorist threats in their jurisdiction; 39 percent listed extremism connected with Al Qaeda or like-minded terrorist organizations. And only 3 percent identified the threat from Muslim extremists as severe, compared with 7 percent for anti-government and other forms of extremism.” Anti-government extremism is of course liberal code for anyone who thinks government is too large, too intrusive and generally out of control. The saga of the police shooting of Keith Lamont Scott in Charlotte, North Carolina continues as the dashcam and bodycam footage is released to the public – although to me, it’s not much of a saga. A brief synopsis of the lead up to the shooting is that the Charlotte-Mecklenburg police were dispatched on another call in the immediate area when they noticed a man seated in an SUV with a pistol is in hand. For a more complete accounting, you may link to my article from a few days ago here. However, according to his mother, Scott was not brandishing a weapon, but was reading the Koran. No Koran or any other book was found at the scene. Was it Police Abuse or an Unruly Criminal? On the coast of North Carolina there are many wonderful beaches and islands to explore. Most of them are fairly serene where families go to get away from the hustle and bustle of everyday life. Islands like Ocean Isle, Holden Beach, Oak Island and Caswell Beach separated from the mainland by the famous Intracoastal Waterway. I can personally attest to the beauty of this area and understand why families go back year after year. Across the Cape Fear River (yes, that Cape Fear from the movie) from Fort Caswell on the end of a peninsula is Bald Head Island. Bald Head is a resort and nature preserve. Being a relatively small and quiet area, the village has all but given up cars, opting instead for golf carts as the main mode of transportation. The Mall family, like many others, has been vacationing on Bald Head for years and until last summer had never heard of or witnessed an incident on the Island. But last summer that all changed. No – the left never cheats. The left never practices voter fraud. We all know this because it’s been what we’ve been fed for years. According to them and their apologists, there is no such thing as voter fraud, therefore there is no need for any voter I.D. laws or checks of any kind. Only the right does such things by way of telepathic voter intimidation. We think racist thoughts and it bars minorities from voting, or some such nonsense. But we all know the left cheats. It’s been this way since the Kennedy presidential election. They bus in people from out of town to vote, dead people rise from the grave to cast their ballot, they illegally register voters, and they enlist the New Black Panthers to intimidate voters like in Philadelphia. And if that isn’t enough, they stuff the ballot box. As we know the LGBT community has been up in arms over States’ passage of various bills to prevent men from using women’s bathrooms and vice versa. And naturally following suit are many corporations and other State governments who apparently believe that donning a wig and a dress should give a guy the right to enter a women’s public restroom or locker room. Somehow this is controversial. Where is the controversy here? Once again we see a tiny fraction of our population attempting to run roughshod over the majority and frightened corporations fall in line for fear they too may be branded as discriminatory. Like little children having a temper tantrum, they LGBT community knows, like the Muslim community and the Black Lives Matter movement, if they scream loud enough, our spineless society will give in to their absurd demands. The NFL, which has become synonymous with political correctness, threatened the state of Georgia saying that signing their bill could cost Atlanta a chance to host a Superbowl. Liberal Disney said they would no longer film in the state of Georgia and other companies are reconsidering plans to invest further in the state – all because these states believe men should be using their own bathrooms. Craig Hicks murdered three young people in North Carolina. More than 5,000 attended the funeral last Thursday, which is more than most heads of state attract. Ban Ki-Moon, the U.N. head toady was one of the first out of gate sending a condolence message. I’m sure he sends out similar messages every week to Mayor Rahm Emanuel in Chicago over the hundreds of black kids shot dead in that city each year. Of course, the leader of the free world, our president, Barack Obama had to inject his usual knee-jerk judicial brilliance into the situation when he said “No one in the United States of America should ever be targeted because of who they are, what they look like, or how they worship.” We recall he did the same with the “stupid” Cambridge cop, Trayvon Martin and Michael Brown declarations. No…Not That Button…Push the Other One! You can’t make this stuff up folks. Boy would I have loved to be there when this happened. 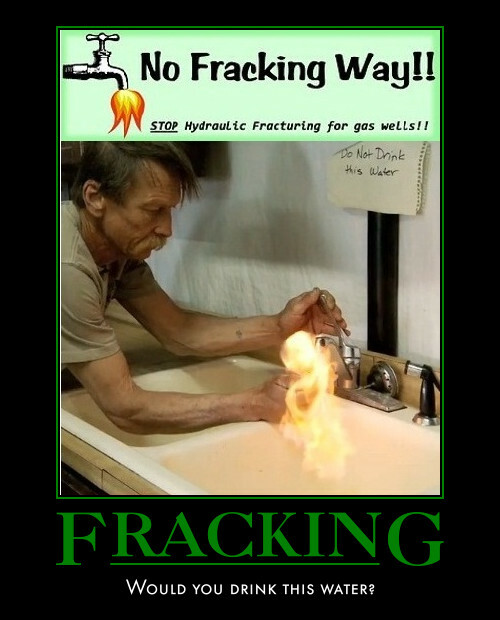 North Carolina is moving forward to legalize hydraulic fracturing — commonly called fracking — after an accidental vote by Democratic state Rep. Becky Carney overrode Democratic Gov. Bev Perdue’s veto on Monday. Perdue had attempted to veto a Senate bill passed to allow the natural-gas extraction technique in her state, WRAL reported. The vote was 72-47, with Carney’s accident providing the final vote necessary for the override. Carney has voted against hydraulic fracturing in the past, and said she spent the day lobbying other Democrats to uphold the veto. When the vote was taking place, House members had to push either a green button to override the bill or a red button to sustain the veto. Carney pushed the wrong button. Moments later, her voice was heard on her microphone, saying, “Oh my gosh. I pushed green.” (I’m sure she was just thinking, “Eco Friendly” thoughts, by pushing the green button). Republicans blocked Carney’s attempt to change her vote, since House rules in North Carolina don’t allow members to correct mistaken votes when the change would affect the bill’s passage. and natural gas was not economically viable. While proponents point to job creation, affordable energy and increased energy independence made possible by the technique, opponents say the chemicals used in the process could potentially hurt the environment, particularly drinking water (which has been proven to be a fabrication). 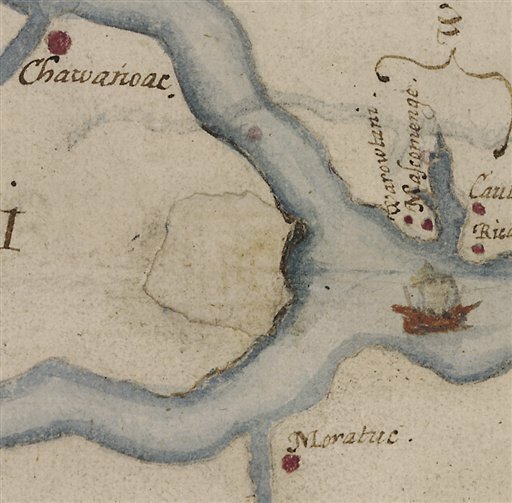 A new look at a 425-year-old map has yielded a tantalizing clue about the fate of “The Lost Colony”, the settlers who disappeared from Britain’s Roanoke Island in the late 16th century. Experts from the First Colony Foundation and the British Museum in London discussed their findings Thursday at a scholarly meeting on the campus of the University of North Carolina at Chapel Hill. Their focus: the “Virginia Pars” map of Virginia and North Carolina created by explorer John White in the 1580s and owned by the British Museum since 1866. 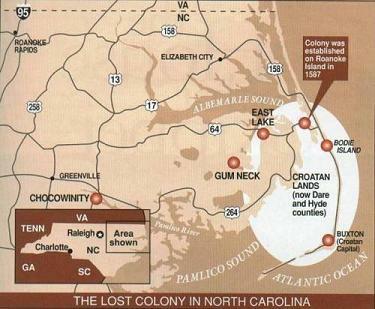 “We believe that this evidence provides conclusive proof that they moved westward up the Albemarle Sound to the confluence of the Chowan and Roanoke rivers,” said James Horn, vice president of research and historical interpretation at the Colonial Williamsburg Foundation and author of a 2010 book about the Lost Colony. Attached to the map are two patches. One patch appears to merely correct a mistake on the map, but the other – in what is modern-day Bertie County in northeastern North Carolina – hides what appears to be a fort. Another symbol, appearing to be the very faint image of a different kind of fort, is drawn on top of the patch. 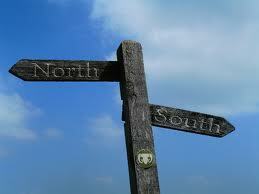 The American and British scholars believe the fort symbol could indicate where the settlers went. The British researchers joined the Thursday meeting via webcast. 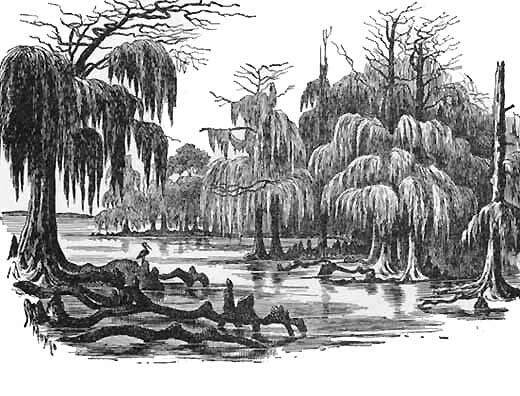 White made the map and other drawings when he travelled to Roanoke Island in 1585 on an expedition commanded by Sir Ralph Lane. In 1587, a second colony of 116 English settlers landed on Roanoke Island, led by White. He left the island for England for more supplies but couldn’t return again until 1590 because of the war between England and Spain. When he came back, the colony was gone. White knew the majority had planned to move “50 miles into the marine,” as he wrote, referring to the mainland. 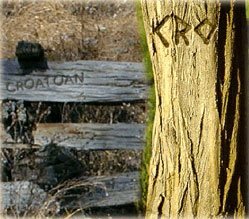 The only clue he found about the fate of the other two dozen was the word “CROATOAN” carved into a post, leading historians to believe they moved south to live with American Indians on what’s now Hatteras Island. But the discovery of the fort symbol offers the first new clue in centuries about what happened to the 95 or so settlers, experts said Thursday. And researchers at the British Museum discovered it because Brent Lane, a member of the board of the First Colony Foundation, asked a seemingly obvious question: What’s under those two patches? Researchers say the patches attached to White’s excruciatingly accurate map were made with ink and paper contemporaneous with the rest of the map. One corrected mistakes on the shoreline of the Pamlico River and the placing of some villages. But the other covered the possible fort symbol, which is visible only when the map is viewed in a light box. The map was critical to Sir Walter Raleigh’s quest to attract investors in his second colony, Lane said. 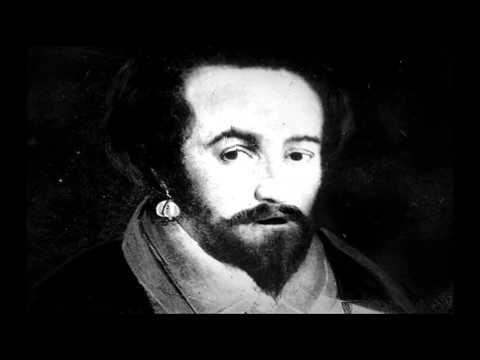 It was critical to his convincing Queen Elizabeth I to let him keep his charter to establish a colony in the New World. It was critical to the colonists who navigated small boats in rough waters. 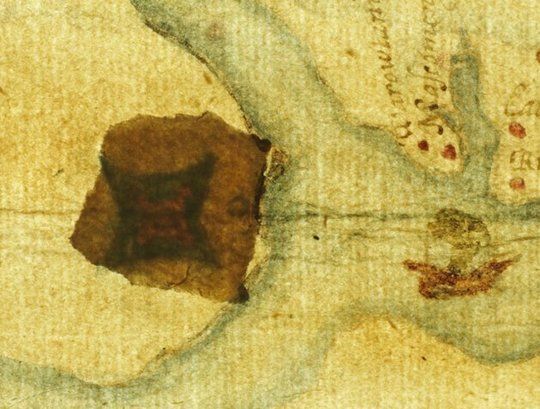 Researchers don’t know why someone covered the symbol with a patch, although Horn said the two drawings could indicate the settlers planned to build more of a settlement than just a fort. The land where archaeologists would need to dig eventually is privately owned, and some of it could be under a golf course and residential community. So excavating won’t begin anytime soon. But it doesn’t have to, said Nicholas Luccketti, a professional archaeologist in Virginia and North Carolina for more than 35 years. Archaeologists must first re-examine ceramics, including some recovered from an area in Bertie County called Salmon Creek, he said. But none have had today’s sophisticated technology to help, he said. 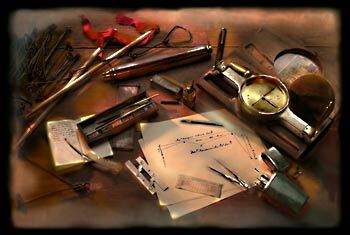 It may only have been a tiny error by surveyors 277 years ago, but it could have stirred up major problems. Part of the small community of Lake Wylie, South Carolina could today find themselves reclassified as being in neighboring North Carolina. Modern surveyors – using state of the art GPS – have redrawn the state border to within a few inches of where it had originally meant to be in 1735 – some 150ft further south of where it is today. But the change could be a monumental upheaval for the hundred or so residents who would find themselves residents of North Carolina – where fuel prices are 30 cents more expensive and fireworks are illegal. Victor Boulware, owner of a small convenience store, the Lake Wylie Minimarket, says a change would destroy his business, stopping the flow of traffic from the more expensive north who flock to his shop for the cheaper fuel. For the owners of 93 properties who suddenly find themselves in another state, it is also a bureaucratic nightmare. The state line determines so much in their lives – what schools they go to, what area code their phone number starts with and even who provides them gas and electricity. Small utility cooperatives in South Carolina are banned from extending services across the state line. Most of the properties in question are near Charlotte, N.C.
“I’m having a hard time being funny about this when mysterious forces bigger than you are shoving you around,” said Frederick Berlinger, who suddenly has been told that he goes to bed at night in Spartanburg County, S.C. after 15 years in what he thought was Polk County, N.C. The seeds of the current problem were sown when the King of England sent surveyors to draw a boundary between the two Carolinas. 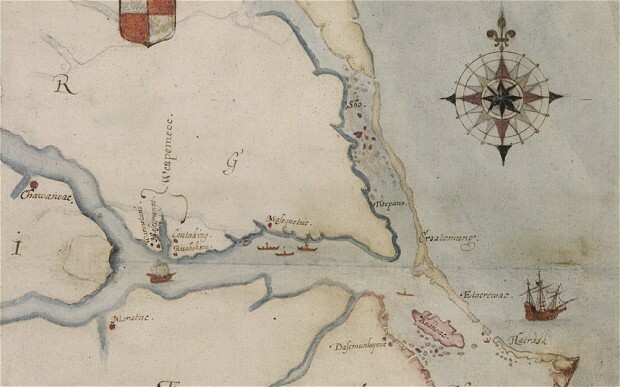 His instructions in 1735 were explicit: Start 30 miles south of the mouth of the Cape Fear River and have surveyors head northwest until they reached 35 degrees latitude. Then the border would head west across the country to the Pacific Ocean. But the surveyors didn’t follow the instructions exactly, and future instructions led to the state line’s twists and turns around Charlotte and in the mountains. The survey, which is about to draw to an end, was designed to put almost all questions about where the line is drawn to rest. 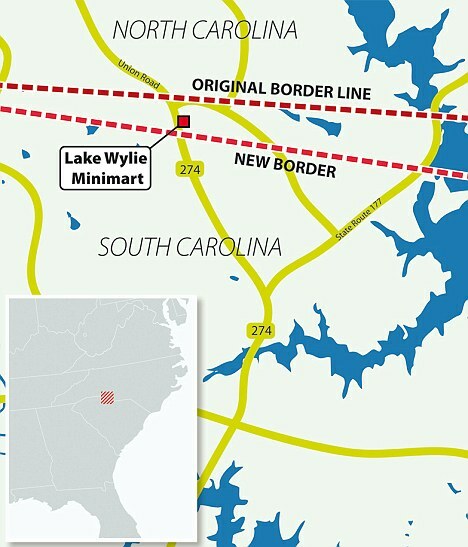 North and South Carolina wanted to solve their problems with a little Southern cooperation, so they created the Joint Boundary Commission nearly two decades ago. The commission meets in Rock Hill, S.C.
Members are expected to work on proposals that they hope will be passed in each state to solve problems that arise from any changes – including an amnesty for any back taxes owed to the other state and allow utilities to cross state lines to serve customers without disruption. Once both Carolinas take action to make the transition easier for the 93 property owners, the commission will submit the new state line to the Legislature in South Carolina and the North Carolina Council of State for approval. Not approving the border could open either state up to a number of lawsuits. The survey work is not finished. The team is preparing to draw the rest of the state line all the way to the Atlantic Ocean. Fewer problems are expected because the area is more rural.